Edison Company of Chicago for the transporting of up to 20 million barrels annually of low sulphur #6 fuel oil from the New Orleans area to Commonwealth Edison's Collins electric generating station now un- der construction near Morris, on the Illinois River southwest of Chi- cago. The initial movement of oil will begin in late 1975. The contract may be extended beyond the origi- nal term. Barge Company, said that Ingram has already awarded contracts for the construction of six high-horse- power towboats and 48 integrated tank barges for the transporting of the oil. The barges will foe of double skin construction and equipped with self-contained pumping and heating capacity so that they can be immediately discharged upon ar- rival at the Collins station. All of the equipment will employ the very latest in shipbuilding technology. Final decisions on the choice of hull forms and power plants will be made after an extensive model test- ing program is conducted in Wa- geningen, the Netherlands. Mr. Donnelly also stated that In- gram already has under construc- tion five towboats and 23 barges for other customers as part of an on- going expansion program. Exploration and Production Divi- sion of Getty Oil Company, has an- nounced the formation of a new off- shore exploration and production department to operate its expand- ing offshore interests. H. Edward Wendt, production manager for 'the division, has been named manager of the new depart- ment. Edd R. Turner. Jr., manager of the former offshore department, is the assistant manager. The new department is responsi- ble for exploration and production activities in the Gulf of Mexico and the Atlantic Ocean. Oil has been operator of the U.S. Advisory Committee (TIAC), in- cluding former astronaut and re- tired Navy Captain, James A. Lo- vell. Mississippi Towing Corp., Minne- apolis, Minn.
Twenty-seven other members were appointed last November. All of the appointments run until June 30, 1975. The committee, originally char- tered as the Western Rivers Panel in 1943, provides advice and con- sultation to the Coast Guard's Ma- rine Safety Council with respect to safe operation of towing vessels and 'barges on inland and coastal waterways. The full committee meets twice a year. During the interim period, particular problems of the towing industry will be considered by smaller working groups. TEFLON® TFE fluorocarbon fiber on their lake tanker operation. This operation transports on a 10 montn a year valve packing was bei replaced each season. A packing that lasted a full season was considered very good. TEFLON fiber. The packing of TEFLON easily lasted the first season. Then it lasted the second season. No one could believe it. So they pulled packing from some of the pumps and valves. It looked good so they left the rest as is. 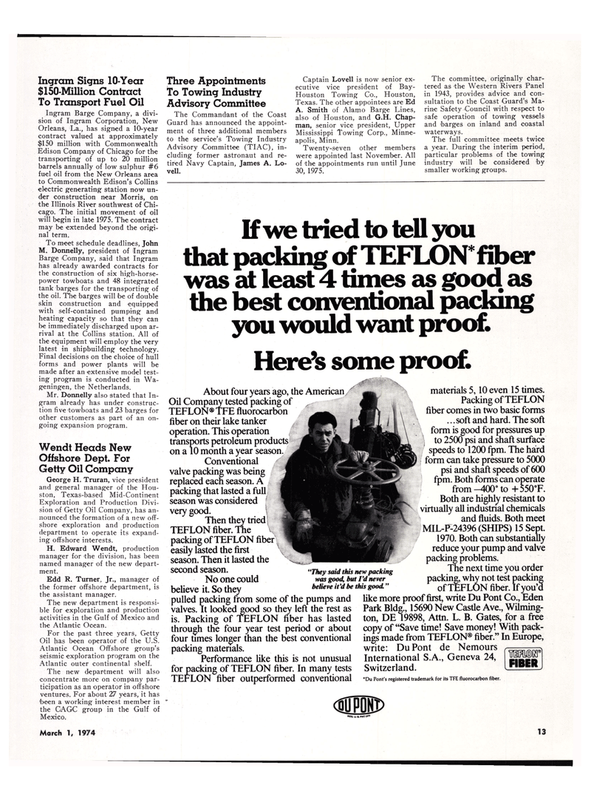 Packing of TEFLON fiber has lasted through the four year test period or about four times longer than the best conventional packing materials. TEFLON I "They said this new packing was good, but I'd never believe it'd be this good " materials 5,10 even 15 times. Packing of TEFLON fiber comes in two basic forms ...soft and hard. The soft form is good for pressures up to 2500 psi and shaft surface speeds to 1200 fpm. The hard form can take pressure to 5000 psi and shaft speeds of 600 fpm. Both forms can operate from-400° to +550°F. MIL-P-24396 (SHIPS) 15 Sept. 1970. Both can substantially reduce your pump and valve packing problems. Switzerland. imm fiber outperformed conventional 'DuPont's registered trademark for its TFE fluorocarbon fiber.